Some Hilltops Region orchards and berry farms offer the opportunity to “pick your own”. The scent of the fruit in the warm sun will entice you, and you’ll take home a delicious reward for your efforts. The main picking season in Young usually starts in late October and continues through until January (weather dependent). The Hilltops Region’s climate and rich soils provide all the essentials required for the growing and ripening of stone fruits. 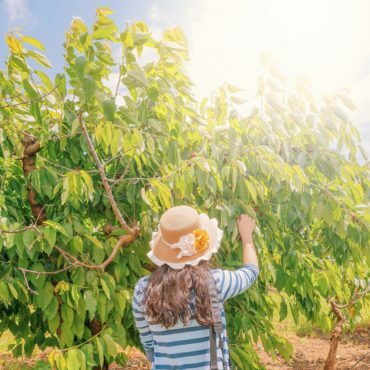 While cherries are the main fruit produced in the region, we grow plums, peaches, nectarines, apricots, figs and olives. Our trees produce ripening fruit throughout summer. The cherry is the last tree to bloom, which typically happens in late September, and yet the first tree to fruit. From November, through to Christmas (weather dependent), cherries are ripening. With the option of picking your own or purchasing the glowing ruby spheres from farm gate stalls, you’ll soon be enjoying this fine fruit. The climax of the cherry season occurs in the first full weekend of December, at the National Cherry Festival in Young. For information on what fruit is available for your visit - contact the Young Visitor Information Centre. WHAT'S AVAILABLE & WHEN TO VISIT? The Hilltops Region’s climate and rich soils provide all the essentials required for the growing and ripening of stone fruits. While cherries are the main fruit produced in the region, we grow plums, peaches, nectarines, apricots, figs and olives. Our trees produce ripening fruit throughout summer. The cherry is the last tree to bloom, which typically happens in late September, and yet the first tree to fruit. From November through to Christmas (weather dependent) cherries are ripening. With the option of picking your own or purchasing the glowing ruby spheres from farm gate stalls, you’ll soon be enjoying this fine fruit.